I want to share my favorite location to watch the evening Disney parade. The parade starts in Town Square, travels down Main Street U.S.A., loops in front of Cinderella Castle, through Liberty Square and finally down Frontierland. This gives you a plethora of options for where to watch the parade, all of them fine. My favorite place is at the beginning of the route. One of the best vantage points is from the platform outside the Walt Disney World Railroad station for Main Street U.S.A. If you're willing to stake out a spot earlier, you can get right up on the railing. From the elevated spot, you get a great unobstructed view of the whole parade. 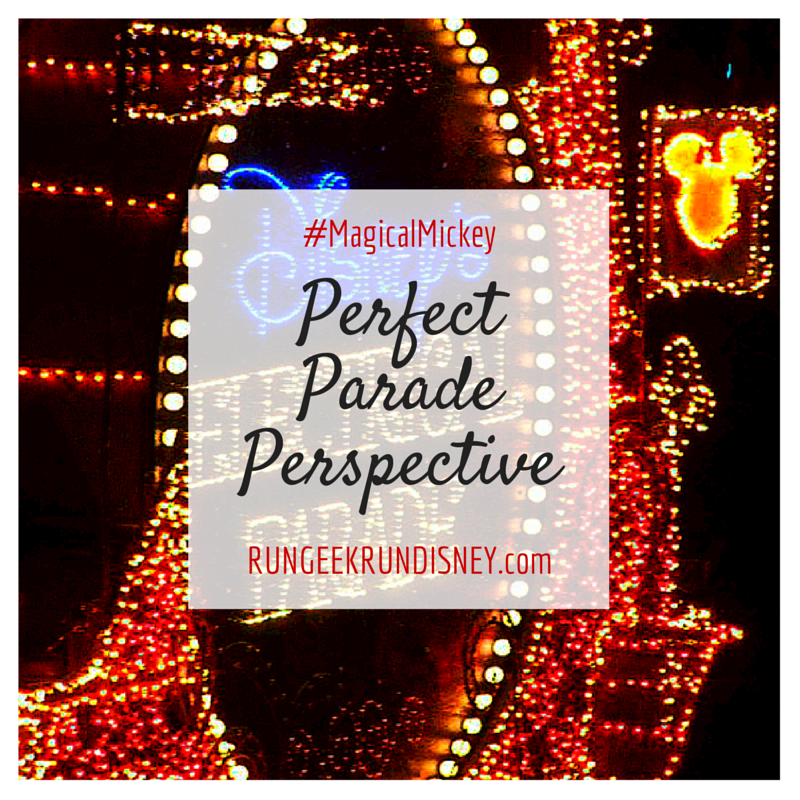 The view of the parade is great, but it's backed by a view down Main Street U.S.A. to Cinderella Castle. This comes with the added benefit that you can watch the parade and keep your view for the fireworks. This is the exact plan of action we took on our honeymoon. We had a long 10 day trip, so we had the time to just sit back and relax. We staked out our spot early, before anyone else, enjoyed some snacks and each other's company until the parade. We even made a few friends, but that story is for another post. 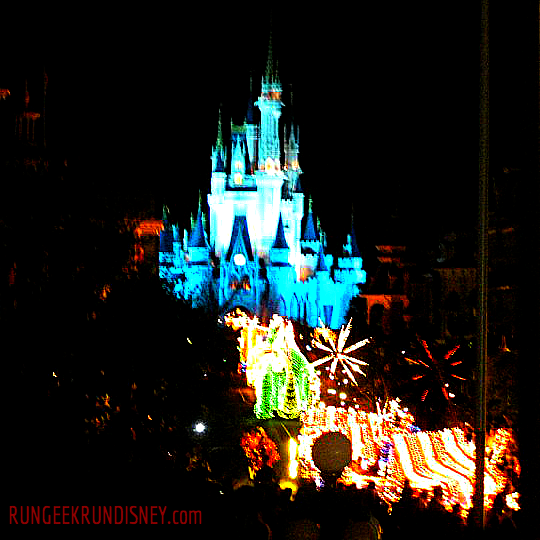 After the parade we still had perfect seats to watch the nighttime spectacular of the Wishes fireworks. It's a perfect 2-for-1 deal. Not only that, you're right by the exit to get out quick before the masses descend onto the monorail, busses and ferries. So make that a 3-for-1. You could "hold" your spot with just a person or two for a little while, but like anywhere at crowded times, wait too long and you'll have people who will look to squeeze themselves in uncomfortably close. If you're willing to invest some time in the spot, you can have a prime view for two great entertainment events at the Magic Kingdom. Where's your favorite place to watch the parades? I've seen people up on that balcony and wondered how it would be to watch the parade from there. Sounds like a great spot! It really is a great view. You have to be there early, but it can be worth it. We ALWAYS go to the train station platform and honestly I am surprised it is never that crowded! I have a funny story about parades. This past weekend my sister and I were staying at the contemporary for marathon weekend. Of course we go to bed super early. Well after we were already sleeping my sister hollers over to me to turn the volume down on my phone ( she thought I was playing games or something). Here it was the music from the electric water pageant right outside our window. We had a great view but didn't really enjoy it since we were in bed! We were there in July, so it was crowded but in July everything is crowded. Haha. Good that its easier other times. That is too funny. Yeah, you can get a great view but not exactly music to sleep by. Oh my. I finally caught the Main Street Electrical parade on my visit last week. 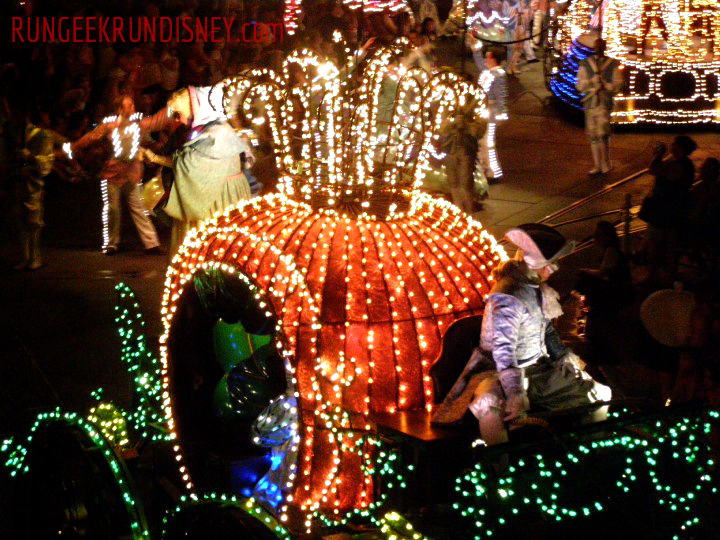 I loved all of the lit up floats and characters! It's a really fun parade. Always has been one of my favorites since I was a little kid. For the parade, we always sneak up by the main crossroad at Main St. near the shops. It makes it easier to make our way out of the park immediately afterwards. Yeah, if you want to leave right afterwards, you need to strategically place yourself. Otherwise you'll just move in a slow herd. If you dont want / need to leave right away though, you can get in some good quick rides while the masses leave. You've found a great spot for watching the parade and for taking photos. Your pictures look fantastic! Thanks. It makes for some good pictures. I actually have a video from it as well that I need to break out the hard drives to find and maybe throw up online to share.